Emerging from the dense growth of BBP’s water gardens are the giant flowers of the Rose Mallow, our latest Featured Plant. Baring a white, pink, and red bloom, these palm-sized flowers look more like something one would expect from Hawaii, and rightfully so. Like many of their tropical relatives, they are Hibiscus. But these plants are native to the east coast of North America. The large petals swirl outward to create a pink tinged white disc, with a red center at peak bloom. If you look closely, you can see holes at the center of the flower. This is where a hopeful hummingbird inserts its beak to find the nectar, as these flowers, like most red flowers, are bird pollinated. Birds are not the only pollinators to drink the nectar. Spend a few moments watching the flower, and you will see a variety of bumble bees drinking the nectar. In fact, early in the morning, you might even catch some bumble bees waking up in the Rose Mallows. Each flower folds in on itself at night, creating the perfect bedroom for sleepy bumble bees. 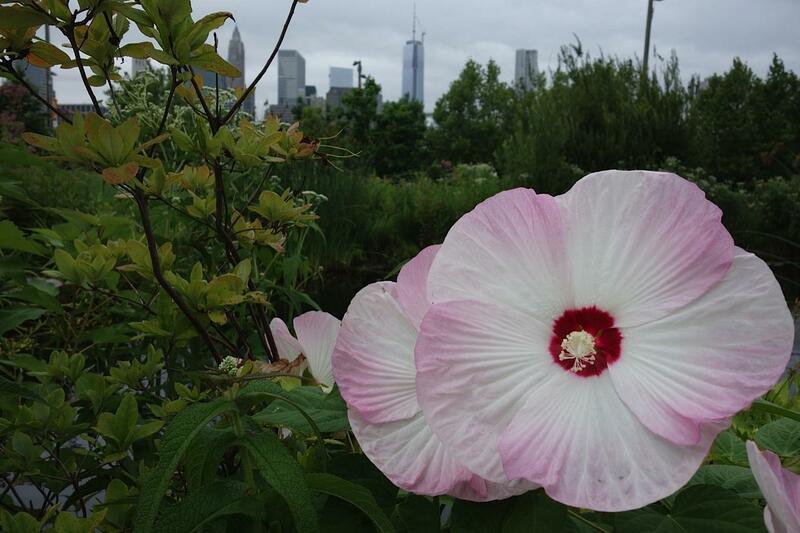 The Rose Mallows need moist soil to grow, which is why you can only find them in the freshwater gardens of Pier 1, and in the bioswale by Jane’s Carousel at Empire Fulton Ferry. Visit soon! These beauties only bloom until mid-August.